The Battle of Tippecanoe (/ˌtɪpikəˈnuː/ TIP-uh-kə-NOO) was fought on November 7, 1811, between United States forces led by Governor William Henry Harrison of the Indiana Territory and Native American warriors associated with the Shawnee leader Tecumseh. Tecumseh and his brother Tenskwatawa (commonly known as "The Prophet") were leaders of a confederacy of Native Americans from various tribes that opposed U.S. expansion into Native territory. As tensions and violence increased, Governor Harrison marched with an army of about 1,000 men to disperse the confederacy's headquarters at Prophetstown, near the confluence of the Tippecanoe and Wabash Rivers. 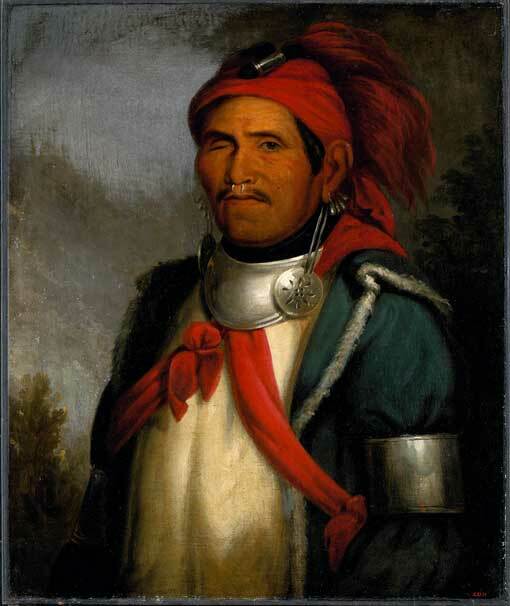 Tecumseh, not yet ready to oppose the United States by force, was away recruiting allies when Harrison's army arrived. Tenskwatawa, a spiritual leader but not a military man, was in charge. Harrison camped near Prophetstown on November 6 and arranged to meet with Tenskwatawa the following day. Early the next morning, warriors from Prophetstown attacked Harrison's army. Although the outnumbered attackers took Harrison's army by surprise, Harrison and his men stood their ground for more than two hours. The Natives were ultimately repulsed when their ammunition ran low. After the battle, the Natives abandoned Prophetstown. Harrison's men burned the town and returned home. Harrison, having accomplished his goal of destroying Prophetstown, proclaimed that he had won a decisive victory. He acquired the nickname "Tippecanoe", which was popularized in the song "Tippecanoe and Tyler too" during the election of 1840, when Harrison was elected president. But some of Harrison's contemporaries, as well as some subsequent historians, raised doubts about whether the expedition had been much of a success. Although the defeat was a setback for Tecumseh's confederacy, the Natives soon rebuilt Prophetstown, and frontier violence actually increased after the battle. Public opinion in the United States blamed the violence on British interference. This suspicion led to further deterioration of U.S. relations with Great Britain and served as a catalyst of the War of 1812, which began six months later. By the time the U.S. declared war on Great Britain, Tecumseh's confederacy was ready to launch its war against the United States and embrace an alliance with the British. After being appointed Indiana Territory of the newly formed Indiana Territory in 1800, William Henry Harrison sought to secure title to Native American lands to open more land for settlers; in particular, he hoped the Indiana Territory would attract enough settlers to qualify for statehood. Harrison negotiated numerous land cession treaties with American Indians, including the Treaty of Fort Wayne on September 30, 1809, in which Miami, Pottawatomie, Lenape, and other tribal leaders sold 3,000,000 acres (approximately 12,000 km²) to the United States. Tenskwatawa, by Charles Bird King. Tenskwatawa, known as the Prophet, had been leading a religious movement among the northwestern tribes, calling for a return to the ancestral ways. His brother, Tecumseh, was outraged by the Treaty of Fort Wayne, and thereafter emerged as a prominent leader. Tecumseh revived an idea advocated in previous years by the Shawnee leader Blue Jacket and the Mohawk leader Joseph Brant, which stated that Native American land was owned in common by all tribes, and land could not be sold without agreement by all the tribes. Not yet ready to confront the United States directly, Tecumseh's primary adversaries were initially the Native American leaders who had signed the treaty. He began by intimidating them and threatening to kill anyone who carried out the terms of the treaty. Tecumseh began to travel widely, urging warriors to abandon the accommodationist chiefs and to join the resistance at Prophetstown. Tecumseh insisted that the Fort Wayne treaty was illegitimate. In an 1810 meeting with Harrison, he demanded that Harrison nullify the treaty and warned that settlers should not attempt to settle the lands sold in the treaty. Harrison rejected his demands and insisted that the tribes could have individual relations with the United States. In the meeting Tecumseh warned Harrison that he would seek an alliance with the British if hostilities broke out. Tensions between the United States and Britain had been high for several months as a result of British interference in U.S. commerce with France. As early as 1810, British agents had sought to secure an alliance with Native Americans to assist in the defense of Canada should hostilities break out, but the Natives had been reluctant to accept their offer, fearing they had little to benefit from such an arrangement. In August 1811, Tecumseh again met with Harrison at Vincennes, where Tecumseh assured Harrison that the Shawnee brothers meant to remain at peace with the United States. Tecumseh then traveled to the south on a mission to recruit allies among the "Five Civilized Tribes". Most of the southern nations rejected his appeals, but a faction of the Creeks, who came to be known as the Red Sticks, answered his call to arms, leading to the Creek War, which also became a part of the War of 1812. Harrison left the territory for business in Kentucky shortly after the meeting with Tecumseh, leaving secretary John Gibson as acting governor. Gibson, who had lived among the Miami tribe for many years, was quick to learn of Tecumseh's plans for war and immediately called out the territory's militia and sent emergency letters calling for the return of Harrison. By mid-September, most of the militia regiments had formed. By then, Harrison had returned, accompanied by a small force of army regulars, and had taken command of the militia. Harrison had already been in communication with his superiors in Washington, D.C., and he had been authorized to march against the confederacy in a show of force, hoping that they would accept peace. Harrison gathered the scattered militia companies at Fort Knox near a settlement on Maria Creek, north of Vincennes; There he was joined by the sixty-man company called the Yellow Jackets, so named for their bright yellow coats, from Corydon, Indiana, as well as the Indiana Rangers. [note 1] From there the entire force of about 1000 men set out northward towards Prophetstown. The force consisted of about 250 army regulars from the 4th US Infantry Regiment, 100 Kentucky volunteers, and near 600 Indiana militia including two companies of the Indiana Rangers. The army reached the site of modern Terre Haute, Indiana, on October 3 where they camped and built Fort Harrison while they waited for supplies to be delivered. 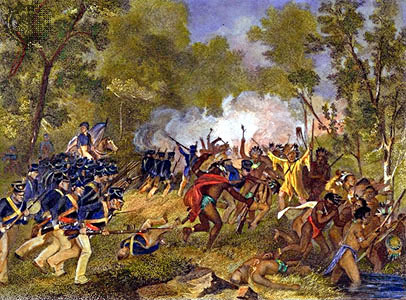 A scouting party of Yellow Jackets was ambushed by Native Americans on October 10 causing several casualties and preventing the men from continuing to forage. Supplies quickly began to run low. By October 19, rations were cut and remained so until October 28 when fresh supplies arrived via the Wabash River from Vincennes. With the army resupplied, Harrison resumed his advance to Prophetstown on October 29. As Harrison's forces approached Prophetstown late on November 7, they were met by one of Tenskwatawa's followers waving a white flag. He carried a message from Tenskwatawa, requesting a ceasefire until the next day when the two sides could hold a peaceful meeting. Harrison agreed to a meeting, but was wary of Tenskwatawa's overture, believing that the negotiations would be futile. Harrison moved his army to a nearby hill near the confluence of the Wabash and Tippecanoe Rivers. There he camped his men in battle array, and kept sentinels on duty during the night. On the west side of the hill on which he encamped was a shallow creek (Burnett Creek), and on the east side a very steep embankment. Because of the nature of the position, Harrison did not order any temporary works to be created around the position as was ordinarily done by encamped armies. The Yellow Jacket company, with Captain Spier Spencer in command, was posted on the southern end of the camp perimeter. The rest of the militia formed a rectangular formation along the edges of the bluff surrounding the camp. Colonel Davis Floyd commanded the militia units guarding the steep bluff on the eastern side of the formation. The regulars, commanded by Major Rodd, and the dragoons, commanded by Maj. Joseph Daviess and former congressman Capt. Benjamin Parke, were kept behind the main line in reserve. In an 1816 conversation with Lewis Cass, the Governor of Michigan, Tenskwatawa denied that he ordered his warriors to attack Harrison, and blamed the Winnebagos in his camp for launching the attack. Other accounts also point to the Winnebago as the responsible party for encouraging the attack and suggest that Tenskwatawa was unable to control his followers as panic set in. Tenskwatawa's followers were worried by the nearby army and feared an imminent attack. They had begun to fortify the town, but the defenses were not yet completed. During the evening, Tenskwatawa consulted with the spirits and decided that sending a party to murder Harrison in his tent was the best way to avoid a battle. He assured the warriors that he would cast spells that would prevent them from being harmed and confuse Harrison's army so they would not resist. The warriors then moved out and began to surround Harrison's army looking for a way to sneak into the camp. Ben, an African-American wagon driver traveling with Harrison's army, had deserted to the Shawnee during the expedition. He agreed to lead a small group of warriors through the line to Harrison's tent. During the late night hours, he was captured by the camp sentries, taken back to the camp and bound. He was later convicted of treason but pardoned by Harrison. Lieutenants Nuge and Klaus, the other two Yellow Jacket commanding officers, were also soon wounded and killed. Without leadership, the Yellow Jackets began to fall back from the main line, retreating with the sentinels. The warriors followed the retreating unit and entered the camp. The soldiers regrouped under the command of future United States Senator, ensign John Tipton, and with the help of two reserve companies under the command of Captain Rodd, repulsed the warriors and sealed the breach in the line. The second charge by the Native Americans targeted both the north and south ends of the camp, with the far southern end again being the hardest hit. Over half of Harrison's casualties were suffered among the companies on the southern end, including Captain Spencer and five other men in his company, and seven other men in the adjoining company. [note 3] With the regulars reinforcing that critical section of the line, and the surprise over, the men were able to hold their position as the attacks continued. On the northern end of the camp, Major Daviess led the dragoons on a counter charge that punched through the Native Americans' line before being repulsed. Most of Daviess's company retreated back to Harrison's main line, but Daviess himself was killed. [note 4] Throughout the next hour Harrison's troops fought off several more charges. When the warriors began to run low on ammunition and the sun rose, revealing the small size of Tenskwatawa's army, the Indian forces finally began to slowly withdraw. A second charge by the dragoons forced the remaining Native Americans to flee. The battle lasted about two hours and Harrison lost 62 men (37 killed in action and 25 mortally wounded); about 126 were less seriously hurt. The Yellow Jackets suffered the highest casualties of the battle, with 30% of their numbers killed or wounded. The number of Native American casualties is still the subject of debate, but it was certainly lower than that of the United States forces. Historians estimate that as many as 50 were killed and about 70–80 were wounded. The warriors retreated to Prophetstown where, according to one chief's account, the warriors confronted Tenskwatawa and accused him of deceit because of the many deaths, which his spells were supposed to have prevented. He blamed his wife for desecrating his magic medicine and offered to cast a new spell and insisted that warriors launch a second attack, but they refused. Fearing Tecumseh's imminent return with reinforcements, Harrison ordered his men to fortify the camp with works for the rest of the day. As the sentries moved back out, they discovered and scalped the bodies of 36 warriors. The following day, November 8, he sent a small group of men to inspect the town and found it was deserted except for one elderly woman too sick to flee; the rest of the defeated Natives had evacuated the village during the night. Harrison ordered his troops to spare the woman, but to burn down Prophetstown and destroy the Native Americans' cooking implements, without which the confederacy would be hard pressed to survive the winter. Everything of value was confiscated, including 5,000 bushels of corn and beans. Some of Harrison's soldiers dug up bodies from the graveyard in Prophetstown to scalp. Harrison's troops buried their own dead on the site of their camp. They built large fires over the mass grave in an attempt to conceal it from the Native Americans. [note 5] However, after Harrison's troops departed the area, the Native Americans returned to the grave site, digging up many of the corpses and scattering the bodies in retaliation. Document released to the public featuring information on the "hostile Indians" of the Wabash after the battle. The day after the battle the wounded were loaded onto wagons and carried back to Fort Harrison for medical care. Most of the militia was released from duty on November 9 and returned home, but many of the long-time soldiers remained in the area a bit longer. In his initial report to Secretary William Eustis, Harrison informed him of a battle having occurred near the Tippecanoe River, giving the battle the river's name, and added that he feared an imminent reprisal. The first dispatch did not make clear which side had won the conflict, and the secretary interpreted it as a defeat. The follow-up dispatch made the United States victory clear, and the defeat of Tecumseh's confederacy became more certain when no second attack materialized. Eustis replied with a lengthy note demanding to know why Harrison had not taken adequate precautions in fortifying his camp. Harrison responded that he considered the position strong enough to not require fortification. This dispute was the catalyst of a disagreement between Harrison and the Department of War that later caused him to resign from the army in 1814. At first, the newspapers carried little information about the battle, instead focusing on the highlights of the ongoing Napoleonic Wars. One Louisville newspaper even printed a copy of the original dispatch and called the battle a defeat for the United States. However, by December, most of the major papers in the United States began to carry stories about the battle. Public outrage quickly grew and many citizens blamed the British for inciting the tribes to violence and supplying them with firearms. Andrew Jackson was at the forefront of those calling for war, claiming that Tecumseh and his allies were "excited by secret British agents". Other western governors called for action: Willie Blount of Tennessee called on the government to "purge the camps of Indians of every Englishmen to be found ..." Acting on popular sentiment, the War Hawks in Congress passed resolutions condemning the British for interfering in the United States' domestic affairs. Tippecanoe fueled the worsening tension with Great Britain, culminating in a declaration of war only a few months later. Until recently historians have accepted the story that Tecumseh was furious with Tenskwatawa for losing the battle, and that Tecumseh had threatened to kill his brother for allowing the attack to take place. According to this story, the Prophet lost prestige after the battle and no longer served as a leader of the confederacy. In their subsequent meetings with Harrison, several Native leaders claimed that the Prophet's influence was destroyed; in some accounts it was said he was being persecuted. Historians Alfred Cave and Robert Owens have argued that the Natives were probably trying to mislead Harrison in an attempt to calm the situation and that Tenskwatawa actually continued to play an important role in the confederacy. Harrison, having accomplished his goal of dispersing the Natives of Prophetstown, proclaimed that he had won a decisive victory. But some of Harrison's contemporaries, as well as some subsequent historians, raised doubts about whether the battle was as successful as Harrison claimed. "In none of the contemporary reports from Indian agents, traders, and public officials on the aftermath of Tippecanoe can we find confirmation of the claim that Harrison had won a decisive victory", wrote historian Alfred Cave. The defeat was a setback for Tecumseh's confederacy, but the Natives soon rebuilt Prophetstown, and frontier violence actually increased after the battle. "If anything," writes historian Adam Jortner, "the strike on Prophetstown made Tenskwatawa's movement stronger." On December 16, 1811, the first of the New Madrid earthquakes shook the South and the Midwest. Many Natives of the northwest took the earthquake as a sign that Tenskwatawa's predictions of doom were coming true, leading many to support Tecumseh, including many of his former detractors. Attacks against settlers by Native Americans quickly increased in the aftermath. Numerous settlers and isolated outposts in the Indiana and Illinois Territories were targeted, leading to the deaths of many civilians. Prophetstown was partially rebuilt over the next year, though it was again destroyed by a second campaign in 1812. Tecumseh continued to play a major role in military operations on the frontier, and by the time the U.S. declared war on Great Britain in the War of 1812, Tecumseh's confederacy was ready to launch its own war against the United States, this time with British allies. Tecumseh's warriors made up nearly half of the British army that captured Detroit from the United States in the War of 1812. It was not until Tecumseh's death at the 1813 Battle of the Thames in Ontario that his confederation ceased to threaten the interests of the United States. When William Henry Harrison ran for President of the United States during the election of 1840, he used the slogan "Tippecanoe and Tyler Too" to remind people of his heroism during the battle. The participants in the battle received the Thanks of Congress. The resolution originally included William Henry Harrison by name, but his name was removed from the resolution before passage. Harrison considered this to be an insult, thinking Congress implied he was the one person in the campaign not worthy of accolades, and he expressed the opinion that it held him up to obloquy and disrespect. He was later awarded the Thanks of Congress and a Congressional Gold Medal in 1818 for victory at the Battle of the Thames. William Henry Harrison returned to the battlefield in 1835 to give speeches during his first presidential campaign. Part of his speech called for the creation of a memorial to preserve the battle site. John Tipton later purchased the land to preserve it. The mission school on the hill was purchased by the Methodist Church to be used as a seminary. Tipton left the battlefield to the seminary in his will and they maintained it for many years and built a larger facility at the location in 1862. The Battle and Harrison were memorialized by two Ohio towns being named Tippecanoe; one changed its name to Tipp City in 1938. In 1908, the Indiana General Assembly commissioned the creation of a 80-foot (24 m) high obelisk memorial. By the 1920s the site had become primarily a Methodist youth retreat. On October 9, 1960, the Tippecanoe Battlefield was named a National Historic Landmark. In 1961, a large commemoration of the 150th anniversary of the battle was held and attended by an estimated 10,000 people. In the following years, the battle site became less trafficked and fell into disrepair. It was later taken over by the Tippecanoe County Historical Association which now maintains the battleground and the seminary building, which houses a museum about the battle. An amphitheater was added to the memorial in 1986. From 1989–90, the amphitheater was used for performances of The Battle of Tippecanoe Outdoor Drama. ↑ The Indiana Rangers had been formed in the early days of the territory to protect the settlers from raids by the Native Americans, but had seen little action in the previous five years. ↑ Spencer County, Indiana was later named in honor of Capt.Spier Spencer for his sacrifice in the battle. ↑ Jacob Warrick, the captain of the adjoining company was also killed in the charge; Warrick County, Indiana was named in his honor. ↑ Daviess County, Indiana was later named in honor of Maj. Joseph Daviess's sacrifice at the battle. ↑ "Fort Knox II". Indiana State Museum. 2009. http://www.indianamuseum.org/sites/vincfort.html. Retrieved 2011-05-07. ↑ Burr, Samuel Jones (1840) The life and times of William Henry Harrison, p. 237. ↑ CRS Report, Recipients of Congressional Gold Medals to 2008. ↑ "Tippecanoe Battlefield". National Historic Landmarks program. National Park Service. http://tps.cr.nps.gov/nhl/detail.cfm?ResourceId=15&ResourceType=Site. Retrieved 2009-06-05. ↑ "Tippecanoe Battlefield History". Tippecanoe County Historical Association. Archived from the original on 17 April 2009. http://web.archive.org/web/20090417020339/http://www.tcha.mus.in.us/battlehistory.htm. Retrieved 2009-03-27. ↑ Welcome Page, The Battle of Tippecanoe Outdoor Drama 1990 Souvenir Program, Summer 1990. Carnes, Mark C.; Mieczkowski, Yanek (2001). The Routledge Historical Atlas of Presidential Campaigns. New York, NY: Routledge. ISBN 0-415-92139-2. http://books.google.com/?id=jK8w5ekxUKgC&printsec=frontcover. Cave, Alfred A (2006). Prophets of the Great Spirit. Lincoln: University of Nebraska Press. ISBN 0-8032-1555-X. Dillon, John Brown (1859). "Letters of William Henry Harrison". A History of Indiana. Bingham & Doughty. ISBN 0-253-20305-8. Funk, Arville (1969, revised 1983). A Sketchbook of Indiana History. Rochester, Indiana: Christian Book Press. Jortner, Adam. (2011). The Gods of Prophetstown: The Battle of Tippecanoe and the Holy War for the American Frontier. Oxford University Press. Owens, Robert M. (2007). Mr. Jefferson's Hammer: William Henry Harrison and the Origins of American Indian Policy. Norman, Oklahoma: University of Oklahoma Press. ISBN 978-0-8061-3842-8. http://books.google.com/?id=bKWrfrjrLEUC&printsec=frontcover&dq=Mr.+Jefferson%27s+Hammer:. Sugden, John (1999). Tecumseh: A Life. New York: Macmillan. ISBN 0-8050-6121-5. Tunnell, IV, H.D. (1998). To Compel with Armed Force: A Staff Ride Handbook for the Battle of Tippecanoe. Fort Leavenworth, KS: Combat Studies Institute, U.S. Army Command and General Staff College. http://cgsc.leavenworth.army.mil/carl/resources/csi/tunnell/tunnell.asp. Edmunds, David R (1983). The Shawnee Prophet. Lincoln, Nebraska: University of Nebraska Press. ISBN 0-8032-1850-8. Feldman, Jay (2005). When the Mississippi Ran Backwards. Simon and Schuster. ISBN 0-7432-4278-5. http://books.google.com/?id=Dc0JB715MccC. "Battlefield History". Tippecanoe County Historical Association. Archived from the original on 24 February 2009. http://web.archive.org/web/20090224152817/http://www.tcha.mus.in.us/battlehistory.htm. Retrieved 2009-02-24.